Autumn colored trees surround the banks of the Oxtongue River in Oxtongue River-Ragged Falls Provincial Park in Ontario, Canada making this canoeing expedition exceptionally beautiful. Canoes can be pulled up along the quieter areas of the Oxtongue River so that people can enjoy a snack and rest. 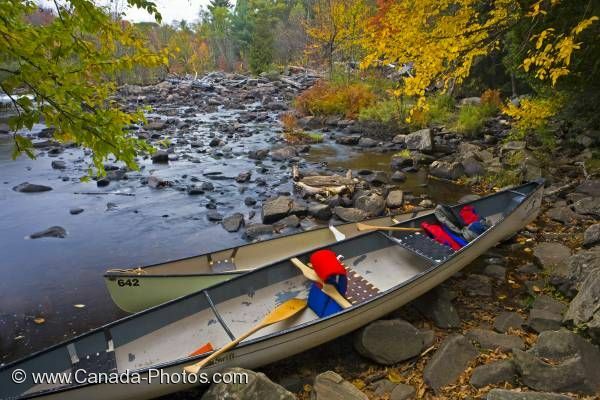 Picture of canoes which sit to rest along the bank of the Oxtongue River in Ontario, Canada after an Autumn expedition.